ASUS Stick PC QM1 squeezes the power of a Windows PC into an ultra-small package that's small and light enough to fit in your shirt pocket. At just 11cm, ASUS Stick PC QM1 transforms conventional computing, bringing the PC experience to more places than ever before. One of the smallest PCs available, ASUS Stick QM1 lets you turn any monitor or TV with an HDMI port into a computer so you can surf the web, stream videos, play light games, and handle productivity tasks. It is powered by up to Windows 10 Home, a quad-core Intel® Atom processor, Intel® HD Graphics, and features 2GB RAM, 32GB storage, and built-in connectivity including both Wi-Fi and Bluetooth! ASUS Stick PC QM1 is your everyday essential that delivers daily productivity, HD entertainment, value, and convenience. 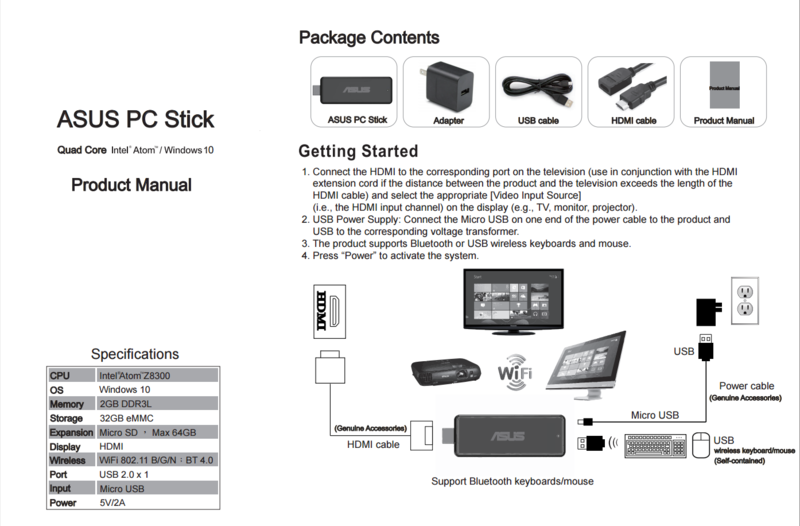 Why ASUS Stick PC QM1? Save valuable space wherever you work or play. This tiny PC brings new computing possibilities to the home, office, or anywhere else you need it. Get all the power, speed and memory you need together with the same operating system, high-quality graphics and wireless connectivity as an everyday desktop PC. ASUS Stick PC QM1 is equipped with a quad-core Intel® Atom processor to deliver responsive performance and high-quality graphics for uncompromised computing experiences. Together with up to Windows 10 Home, high- speed storage, Wi-Fi, Bluetooth, and other connectivity options, it is ready to help you get work done or keep you entertained. 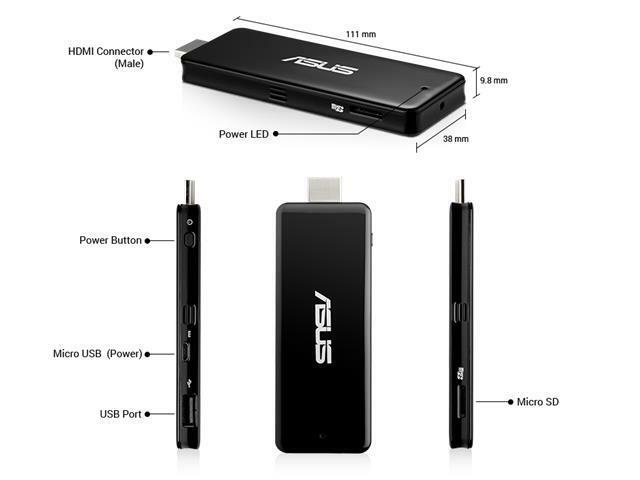 Despite its tiny size, ASUS Stick PC QM1 provides wide expandability options. Whether you want to attach peripherals or upgrade your storage space, it has you covered with built-in USB and HDMI ports, and a micro SD card slot. ASUS Stick PC QM1 is the perfect TV companion. Together with a wireless keyboard and mouse, it transforms any TV or monitor with an HDMI port into a PC, so you can search the web, stream TV programs and movies, play light games, share your vacation photos, send email, and perform other computing tasks on the big screen. 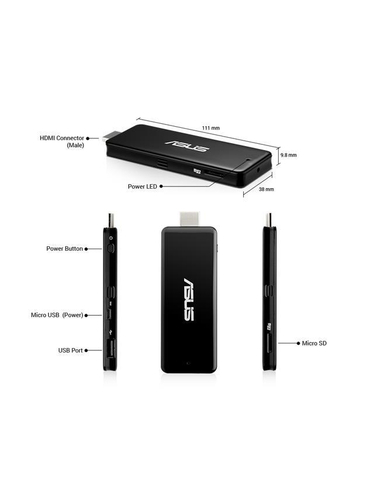 ASUS Stick PC QM1 brings new possibilities to your business. Whether you need to create digital signage, make effective employee kiosks, connect to a conference room projector, deploy multiple thin clients or equip mobile employees, or set up back-office. 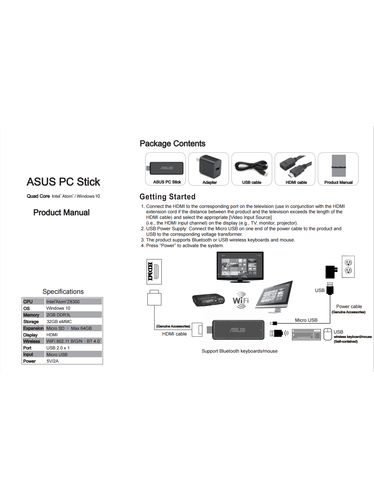 ASUS Stick PC QM1 is the perfect, cost-effective solution for these tasks and more. With capable performance and a choice of operating systems, ASUS Stick PC QM1 is an ideal business partner.